Once Up on a Horse is now located just outside of Wilsonville in Newberg, Oregon. 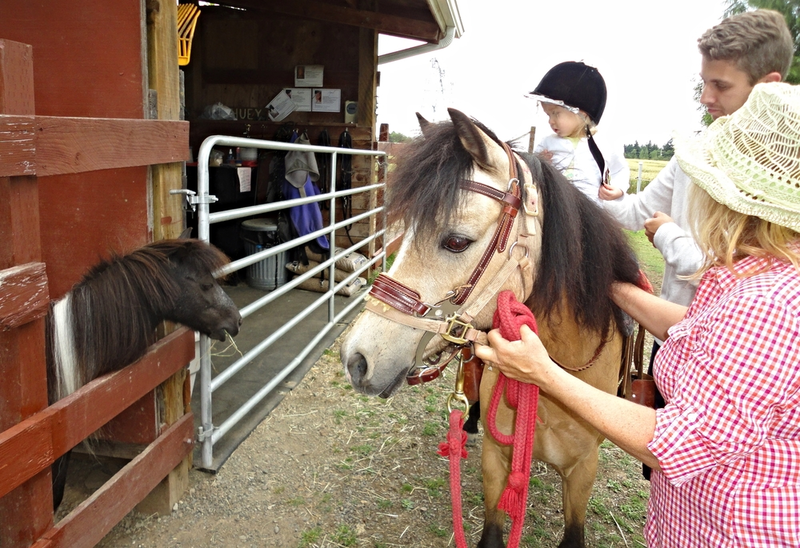 We are a place for children and grown-ups, horses, and ponies to come together in a safe & fun environment. Some of our programs are for young children between 2 and 10 years of age. We also offer programs for beginners of all ages and for family groups. We are building a community that allows our clients and their families to experience the connection between human, horses, and nature that provides calm fulfillment to their lives. We offer both group programs that introduce horses and horsemanship in a gentle, easy manner as well as private riding lessons for children and adults ready to explore riding more intensely. For those looking for more specific therapeutic benefits, we have a PATH certified therapeutic riding instructor. Please feel free to give us a call! Established in Portland, Oregon in 1995 by owner Susan Schramm, Once Up on A Horse boasts an outstanding safety record and a truly stellar history of providing family fun. Susie received her BHSAI (British Horse Society Assistant Instructor) Certificate from Porlock Vale in Somerset County, England in 1973. She was the school horse program director and instructor at the Lake Oswego Hunt Club from 1985 to 1992. Susie founded Once Upon a Horse in 1995 and has since been offering a safe, fun, educational approach to riding. She can instruct both children and adults from a beginner level. Susie's personal horseback riding experience is primarily in the English riding style but she has also has some experience in eventing competition, as well as Western Pleasure. She respects both English and Western riding disciplines but loved jumping so English was a better fit for her. Susie directs and coordinates all RidingLessons, Birthday Parties, Field Trips, and Horse & Pony Planet programs at Once Upon a Horse. She's a natural with children, and is also one of the instructors in our Down in the Barnyard farm and garden based learning program. Bev is a PATH Intl. (Professional Association of Therapeutic Horsemanship) Certified Therapeutic Riding Instructor. With her 20+ years as a preschool director, hands on teaching of preschool age children, and 9 years as a California Credentialed Resource Specialist Teacher for children of all ages with mild to moderate disabilities, Bev founded her own therapeutic riding instruction program in 2011, before moving to Oregon and partnering with Susie at Once Upon a Horse. With a well rounded background and extensive experience, Bev brings Once Upon a Horse into the world of Therapeutic Riding and Equine Facilitated Education. Bev is the program director for Down in the Barnyard, our farm and garden based, recreational learning program for kinder ages, and is now available for individual Therapeutic Riding lessons as well. Both Susie and Bev have helped many children and adults overcome a fear of horses through steady instruction in horsemanship. They are strong believers in the importance of ground work with horses and building a bond between students and their horses.